Some people with no apparent problems with their eyes, report that it is “uncomfortable” to look at certain patterns – including a page of words. Some people find that the words appear to move, wobble or flicker while others see colours or patterns in the words. This tends to make reading for any length of time uncomfortable and can lead to eyestrain, headaches or even migraines. For reasons that are still not well understood, these disturbing effects can often be reduced or even eliminated by placing a sheet of coloured plastic (an overlay) over the page or using coloured lenses. Interestingly, the colour required to achieve this varies from one person to another and the colour can be different for overlays and lenses. Read Ez is suitable for children from age 5 upwards to Adult. ReadEZ Overlays are available in 12 colours (A-L), more colours than available in any other system. 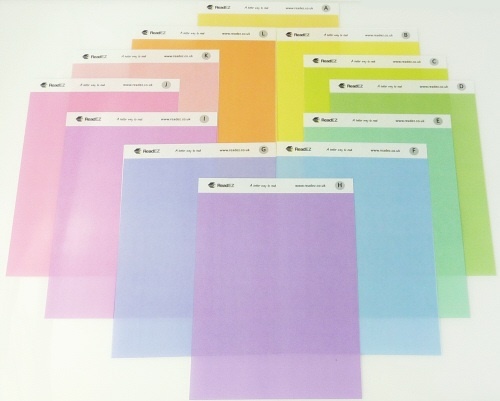 All our colour solutions have been carefully chosen by a team of vision experts to provide the optimum saturation (colourfulness) and transmittance (darkness) to minimise the symptoms of Visual Stress/Meares-irlen syndrome.The overlays themselves are made of durable acetate and come as A5 sheets making them ideal for reading pages of any size. 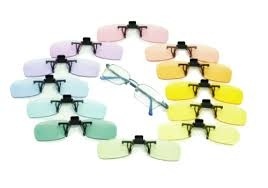 ReadEZ Spectacles are available in 12 colours (A-L). If you wear prescription spectacles, you could use a ReadEZ clip-on or speak to us about ordering spectacles with a ReadEZ tint. If you do not require a spectacle prescription, you can order our non-prescription spectacles with your ReadEZ tint. We have a range of frame styles and sizes suitable for adults and children. Can I use the same colour for my spectacles as I use for my overlay? When you use an overlay, only a small part of your visual field is coloured whereas when you look through a coloured lens, everything you see is coloured and the eye tends to adapt the colour. This means that the preferred colour for a coloured lens is sometimes different to the preferred colour for an overlay. If you already use an overlay, you could ask us to assess you for the optimum colour for a tinted lens. R&J Moore opticians are approved READ EZ screening centres and use the latest Read EZ software to diagnose and manage visual stress and Meares-Irlen syndrome. Firstly before we screen you we will examine your eyes to make sure they are healthy and glasses if needed are up to date. Please contact us for an eye examination and Read EZ screening appointment at your nearest practice. 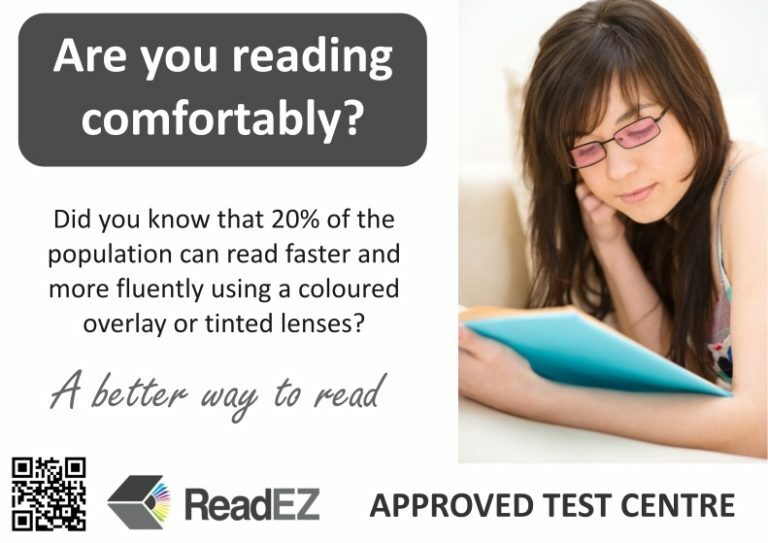 The Read EZ screening is £45 and takes approximately 20 minutes. Multifocal Read EZ lenses are available at extra cost.